Carter Hodgkin, After Effect 9, Watercolor/gouache, 12 in X 10 in, 2002. Carter Hodgkin, After Effect 23, Watercolor/gouache, 12 in X 10 in, 2002. Carter Hodgkin, Neural Propellant, Watercolor/gouache, 12 in X 10 in, 2002. 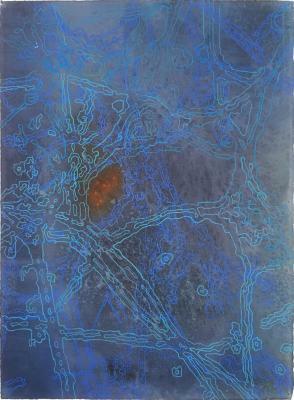 Carter Hodgkin, After Effect 5, Watercolor/gouache, 24 in X 18 in, 2002. Carter Hodgkin, After Effect—Safety Zone, Watercolor/gouache, 24 in X 18 in, 2002. Carter Hodgkin, After Effect 1, Watercolor/gouache, 24 in X 18 in, 2002. Carter Hodgkin, Re-iteration #36, Digital /Giclee, 2005.